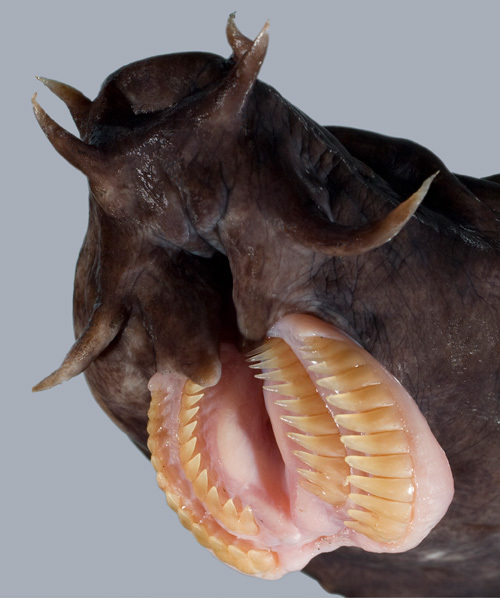 Hagfish are eel-shaped, slime-producing marine fish. They are the only known living animals that have a skull but no vertebral column, although hagfish do have rudimentary vertebrae. 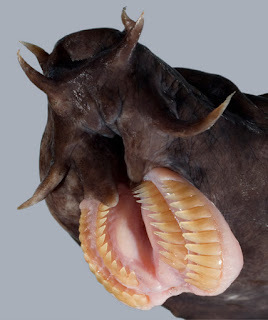 Along with lampreys, hagfish are jawless. The classification of hagfish had been controversial. 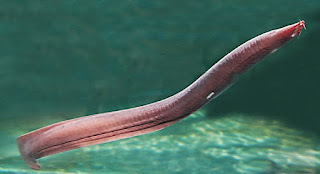 The issue was whether the hagfish was a degenerate type of vertebrate-fish that through evolution had lost its vertebrae (the Original scheme) and was most closely related to lampreys, or whether hagfish represent a stage that precedes the evolution of the vertebral column (the alternative scheme) as is the case with lancelets. Although DNA evidence has supported the original scheme. Hagfish are typically about 0.5 m (19.7 in) in length. The largest known species is Eptatretus goliath, with a specimen recorded at 127 cm (4 ft 2 in), while Myxine kuoi and Myxine pequenoi seem to reach no more than 18 cm (7.1 in) (some have been seen as small as 4 cm (1.6 in)). They have cartilaginous skulls and tooth-like structures composed of keratin.